Enrico Ceccone from the University of Bath came to talk to Language Students at BHASVIC. Students from Hove Park School, Downlands School in Hassocks and from Reigate Sixth Form College joined BHASVIC students to learn about the value of studying languages given the need for linguists in the work force at the moment. 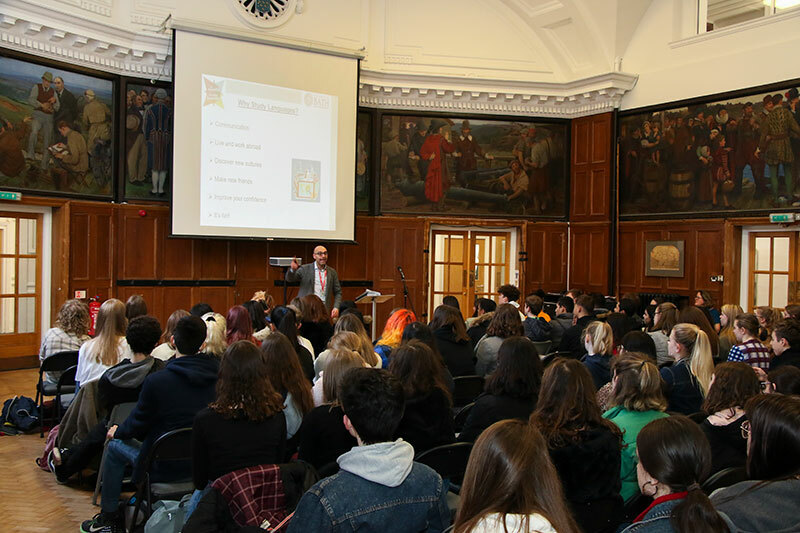 Enrico also offered students an insight into the type of courses offered at Bath, ranging from single honours degrees in French, German, Italian and Spanish to joint honours where students can combine two languages or choose to study one language with Business or Politics. All students at Bath, whatever their degree, can choose to add options in a range of languages to their course: the offer is wide - Russian, Mandarin and Portuguese and others. Enrico’s presentation was informative, inspiring and entertaining and many students said it had really made them think about the importance of continuing with languages and the importance of exploring the courses in depth before choosing a course.